There is a lot of recent birding news, and I thought I would post some. And also make it a weekly feature, if possible. 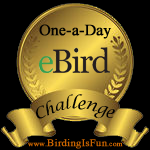 :: The American Birding Association has launched “Listing Central“, a site for ABA members to enter “Big Day” as well as county, province, or state lists. :: From a Citrine Wagtail in Vancouver to the Bramblings sightings in Victoria/Vancouver/BC interior, British Columbia is the place to be now for rare birds. The latest sighting is a Red-flanked Bluetail in southeast Vancouver. The Red-flanked Bluetail is an Old World Flycatcher, and if the sighting is accepted, it would be the first Bluetail record for Canada. :: The Cornell Lab of Ornithology and the Black Swamp Bird Observatory in Ohio have co-ordinated to create the new Young Birders Network, to help young birders connect in person and through social media, to learn about birding opportunities, and help start young birders clubs around the country. There’s a Facebook page too which should become a great place for young birders to get and stay connected. :: The oldest known Northern Shrike in North America has been spotted on her winter territory near Ashland, Wisconsin. She is believed to be at least eight-and-a-half years old, and was first banded on March 16, 2006.
:: The winners of the Great Backyard Bird Count photo contest have just been announced, and the first place photo is by Ben Thomas of Georgia. The beautiful photo is of a Cedar Waxwing and it’s a well-deserved first place; you can see the photo at the previous link. :: More on the young birder front: the American Birding Association has announced its 2013 Young Birder Summer Camps. On a side note, I’m going to have a post up shortly at the ABA’s Eyrie blog on camp and workshop plans for young naturalists. I’ll post a link when it’s up. I’m very excited to be writing for the new Canadian multi-author bird blog, Bird Canada! 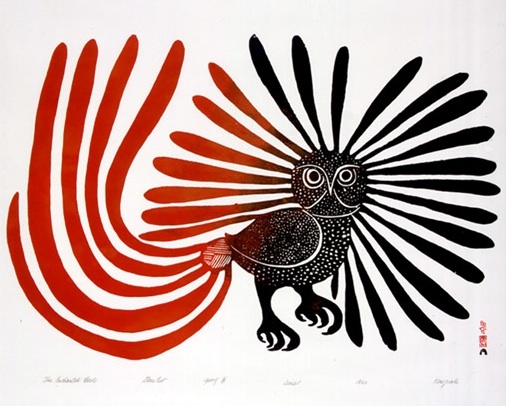 My monthly post is up today about Canadian art legend, Kenojuak Ashevak, who died earlier this week. I’ll be posting every month on or around the 10th. Thanks to Pat Bumstead for asking me to participate. See you there! 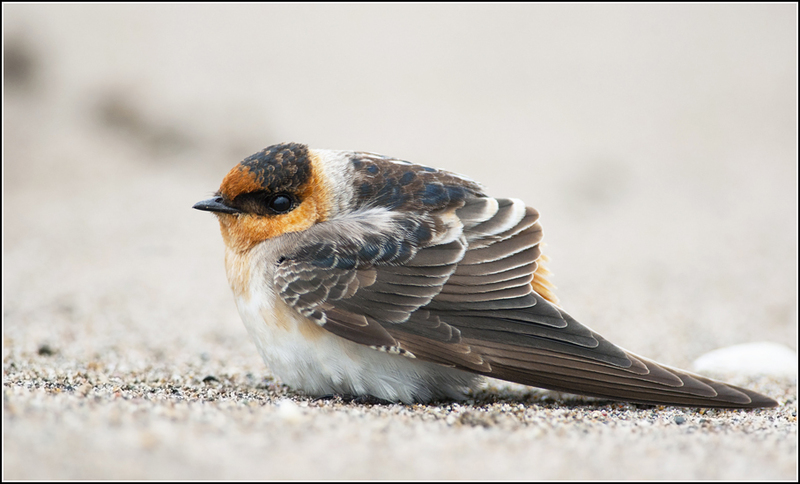 Yesterday morning, the 2013 Bird of the Year was announced by Robert Mortensen for the American Birding Association. To read more about the Common Nighthawk visit the ABA Bird of the Year page. The Common Nighthawk artwork is by Andrew Guttenberg and will be featured on the January cover of Birding magazine. Have you ever wondered what it would be like to break a provincial or state “Big Year” record? Josh Vandermeulen knows what it’s like now! Josh, who is 22 and graduated from the University of Guelph with an ecology degree last year, did an Ontario Big Year in 2012. 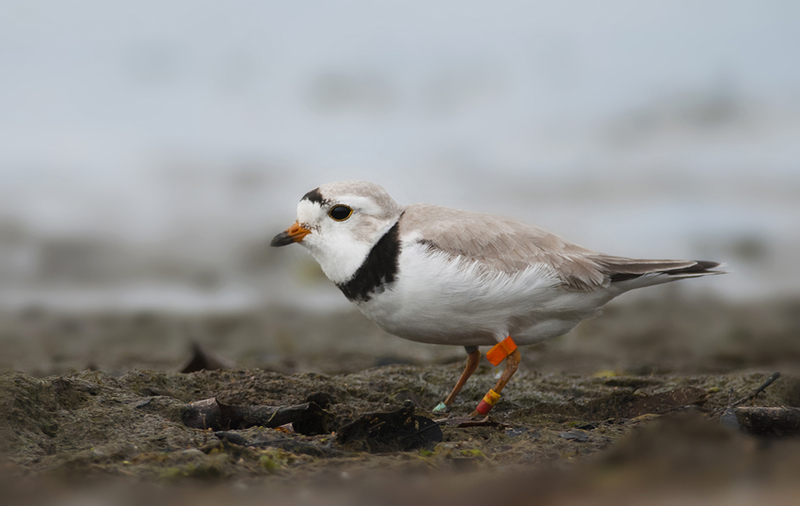 He set a new provincial record for the most bird species spotted in one year — 344. To set the new record, Josh not only had to record a sighting of every single bird seen annually in Ontario, but also had to see about 20 rare and unusual species. The previous Ontario Big Year record of 338 birds had been set in 1996 by Glen Coady. While reading Josh’s blog, Ontario Birds and Herps, the other month, and also seeing some articles about his Big Year, I thought it would be interesting to interview him for my own blog and learn more about his project. PB: First, tell me a little about yourself, for example, where you are you from, your university experience and major, and so on. Josh: I grew up in the town of Cambridge, Ontario (about 80 km west of Toronto). I have always been interested in wildlife and ecology my whole life, and so I went to the University of Guelph to complete an Ecology degree. I graduated this past June, partway through my “Big Year” attempt. While 2012 was entirely devoted to birding, my first love was, and always will be, reptiles and amphibians. 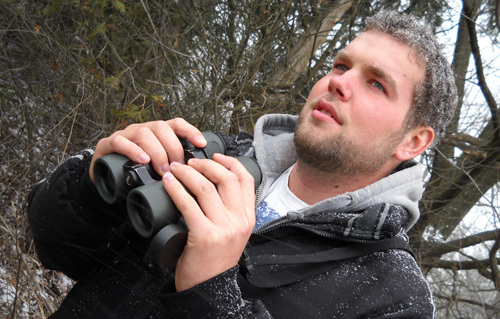 Josh: I had always noticed birds when out in the field chasing snakes or turning over logs for salamanders but it wasn’t until 1st year of university when I really took an interest in birds. I joined the Wildlife Club at the university and we went on several trips, including the Bruce Peninsula and Algonquin Provincial Park. Quite a few of the members were birders, so naturally I started paying more attention to birds! PB: Why did you start a Big Year? How long had you been thinking about it? Josh: I decided to do a “Big Year” for several reasons. First, I would be graduating from university and I was looking forward to taking some time off and traveling extensively for the rest of the year. Second, it gave me an excuse to explore much of Ontario and visit unique areas in the province that I had never been to. In particular I was drawn to the northern reaches of Ontario, including the James Bay region. Third, attempting a Big Year would be very much like a strategic game. It fascinated me hearing stories of other Big Year attempts, and I embraced the challenge of trying to maximize my odds of where I would be throughout the year to see as many bird species as possible. PB: Did you ever feel that it would be hard or impossible to beat the previous record of 338 species? Josh: I always thought that the record would be nearly impossible to beat, since the record holder had a “perfect storm” of events letting him have such a massive year: many chase-able rarities, a hurricane, determination, and financial stability. But at the same time, I realized that it would be possible to break if someone went all out, had a bit of luck, and picked the perfect year to attempt one. Fortunately I lucked out, and the birding gods were smiling down on me! PB: During your Big Year, did you have a “nemesis bird” or was there a species you were hoping to see but didn’t? Josh: Several species “haunted” me throughout the year. Ibises in particular were elusive, as all three species were seen in the province at one point or another. There were probably a dozen reports of ibises, including a Glossy Ibis that was present for the entire time that I was in James Bay in October, unable to chase anything! Of course, it had disappeared before I was back in the south. PB: What was the most exciting part of your year? Josh: I would like to say the record-breaking bird (a Northern Fulmar in southern James Bay), but that probably wasn’t the case since I was unable to share the news with anyone for quite some time after, due to my remote location. Often the most exciting birds this year were the unexpected — birds that appeared in your view when you were least expecting them. The Western Kingbird at James Bay that whipped by that I was able to successfully track down and ID with Alan Wormington was a thrill. Another example were the Fish Crows I found with Andrew Keaveney along the Niagara River (first confirmed winter record for the province, and year bird #100). However there were some mega-rarities which I chased that caused an adrenaline rush that was hard to beat. In particular, Ontario’s third ever Magnificent Frigatebird at Rondeau Provincial Park was one of the year’s major highlights! PB: Did technology help you with your year, and do you think you would have seen as many species without the use of technology? Josh: Technology certainly played a role. I heard about many rarities through the provincial listserv (ONTbirds), texts from other birders, phone calls, and emails. The bird database Ebird.org was in particular very useful, since I could arrange it to send me email alerts about any year bird I still “needed” which other people had reported. Technology certainly helped me see a great deal more birds than what was possible in 1996, when Glen Coady set the original record. PB: What sort of planning and arrangements did you do for your Big Year? Did you do any special budgeting? Do you have any helpful hints for others, especially young birders and students, who might be planning a Big Year? Josh: I decided to do a Big Year long before the year started, so I was able to prepare well. For instance, I created a coding system, ranking every Ontario bird from code 1 (abundant) to code 6 (less than 3 provincial records). This was helpful in allowing me to know the overall “rare factor” of each species. I also planned a few trips, but tried to keep my schedule as open as possible throughout the year. Financially, I was able to save a little bit of money (tough as a full-time student!) but not nearly enough to last the year. I essentially lived on a shoe-string budget, living out of my car or at my parent’s place to save money on hotels or rent. The best piece of advice would be to have good relations with other birders, and let people know you are doing a Big Year. It can’t be done without the help of others, and if people like you, and they know you are doing a Big Year, they might help you out at some point with a rare bird that isn’t supposed to be public! Another piece of advice: enjoy the ride. Often it is easy to get caught up in the numbers and trying to break a record, and some experiences might pass you by without you fully enjoying them. A fantastic trip to a pristine corner of the province is still a fantastic trip, even if that rarity eludes you! PB: I really enjoy reading your blog. Did you find it hard to blog during the year with all the traveling you did? Josh: Thank you! It was difficult at times, especially when I was on the road and living out of my car. Fortunately most towns have free wifi somewhere, so that definitely helped as blogging gave me something to do when it was dark and birding was done for the day. It was particularly difficult when I was at Point Pelee in the spring, since I was birding non-stop from 6 AM to about 8 or 9 PM every night. PB: What was the rarest species you saw last year? 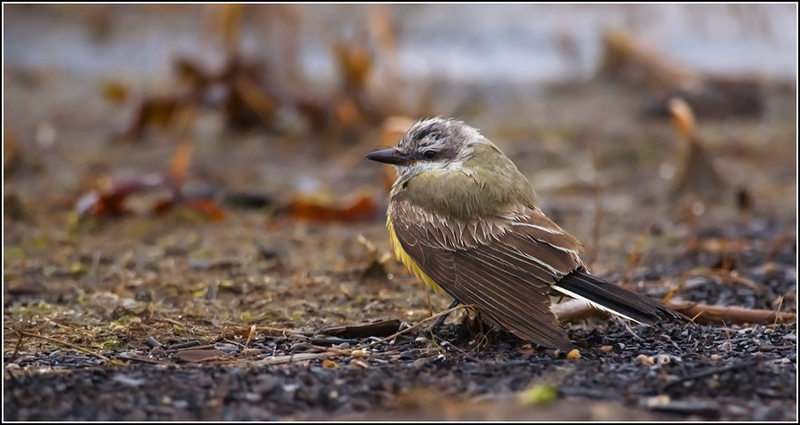 Josh: The Thick-billed Kingbird at Presqu’ile Provincial Park was the first provincial record, and only second Canadian record. As well, Alan Wormington and I found a Great Cormorant on James Bay, which was the only provincial record away from Lake Ontario. Both major highlights last year! PB: What are your plans for 2013, and for the long term, and are you planning on another Big Year in the future? Josh: In 2013, I still hope to go birding regularly, just not on the same scale as last year. I am looking forward to getting back into the “herp scene” and focusing more on photography. Additionally, I will hopefully be working for an environmental consulting agency doing surveys for birds and other organisms and traveling more outside of Ontario. I am also planning on visiting Scotland several times in the near future since my girlfriend is studying veterinary medicine in Edinburgh. It is a beautiful place with a unique set of birds and other wildlife that are unfamiliar to me. As far as whether I will do another big year, I certainly don’t think so! It was a lot of fun and I was able to explore some awesome areas and see cool birds, but it is a very time-consuming endeavor and I had to make a lot of other sacrifices to attempt a Big Year. I certainly have no regrets, since it was an awesome year! Congratulations again, Josh, and thanks for letting me interview you about your Big Year! Thank you as well for letting me post some of your beautiful photographs. 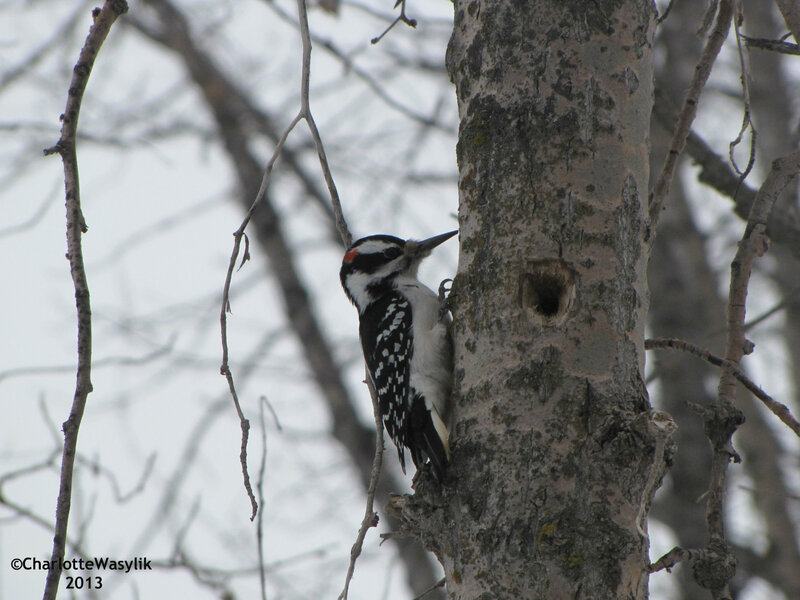 Have a great birding year in 2013!